Want to make something really quick and delicious for dinner? 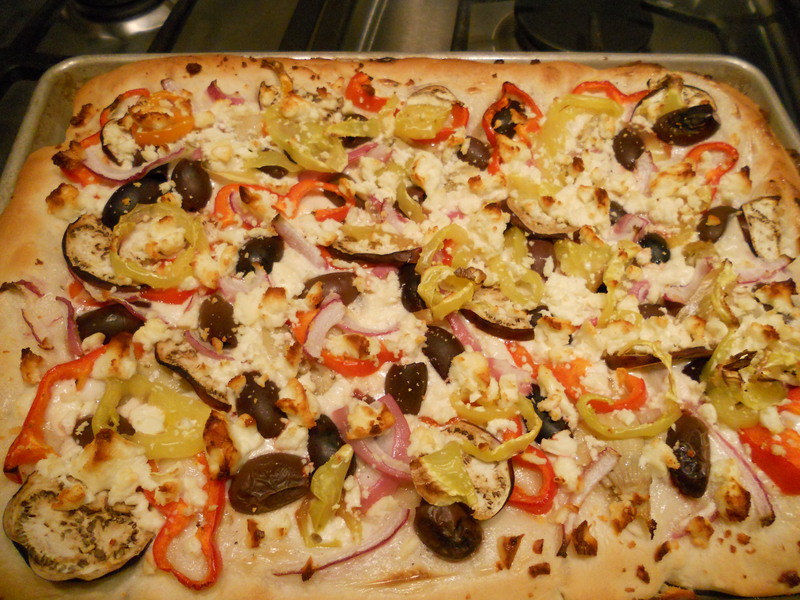 Try making a Mediterranean pizza. Tonight I made pizza dough using my Kitchen Aid mixer but I have made the same pizza using premade pizza crusts that are widely available at grocery stores (Mama Mary’s, Boboli’s, Trader Joe’s). Pizza dough I make myself has little or no fat but in a pinch for time I really like the premade. Now, don’t be put off by the Hidden Valley Ranch dressing, this is really tasty. I prefer to use Hidden Valley Light Ranch dressing (but not fat free). Spread ranch dressing onto pizza crust, just enough to coat. Top with vegetables, feel free to substitute with vegetables of your choice (broccoli, fresh tomato slices, mushrooms slices and thinly sliced zucchini all work well) Top vegetables with thyme and crumbled feta. For precooked pizza crust, follow cooking times and temperatures on package of crust. For pizza dough (either homemade or purchased but unbaked) bake at 425 degrees for 15 to 18 minutes or until crust is lightly browned and cheese is melted and beginning to brown. One Response to Dinner in a flash! It is like papa lou’s! does it taste similar to the ranchero veggie?? ?